The samples reportedly measure 7.2 inches, just 0.1 inches smaller than the main panel on the Samsung Galaxy Fold, according to South Korea's ETNews. The site didn't offer many other details, but did say that while Samsung is currently able to produce about 2.4 million foldable displays per year, it's contemplating ramping up to 10 million. Samsung would be a likely candidate for providing foldable panels to Apple since it already supplies most of the OLED components for the iPhone XS and XS Max. In fact while fellow Korean giant LG joined Apple's OLED supply chain last year, it's unlikely to catch up with Samsung in the near future, if at all. Apple has shown interest in foldable OLED for years in the form of related patent applications. 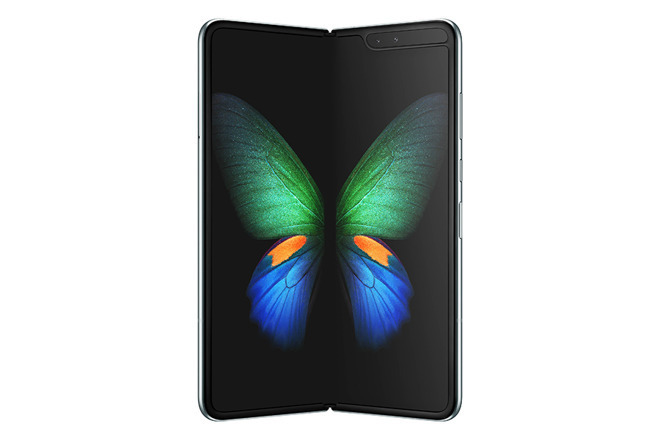 With the launch of the Galaxy Fold, the company may now be under pressure to deliver a competing product. 2019 iPhones are expected to retain fixed panels however, and the typical analyst view is that Apple won't have any foldable iPhones ready until at least 2020. Even then it's not clear what approach Apple might take -- the Galaxy Fold expands from a phone into a tablet, but it also costs at least $1,980, making it more expensive than most tablets and laptops. Apple may want to find some means of pushing down the cost, whether that involves waiting for cheaper production or using a simpler design. Why isn’t the title prefixed with “Sketchy” just as the recent AirPods rumor? Apple needs at least 200-250 million units of these screens a year if they were to buy these. At the bare minimum even the iPhone X in its lifespan sold 60 Million. Of course Samsung wants to use Apple as an advertisement for their bendy stuff. Stop this baseless talk. I would not even consider fold-able iPhone for next few years if the price is what it is. Has to come down under $1500. A folding Apple phone would almost certainly cost more than an iPhone X and that phone supposedly ran out of steam before it had been on the market for a full year. Price for consumers is an issue so I can't see Apple needing 200 million screens. Not by a long shot. I think they'll produce a folding phone, though. And it will be very expensive. If Apple was actually building a foldable phone for 2020, wouldn’t it have received samples much earlier than this? With this timing it is probably 2021 unless foldable phones actually became popular and Apple had to do a crash program. I suspect Apple has no firm plans for 2020 but like any good corporation, it is exploring all product options. Where did you get those numbers from? How many do you think Samsung or Huawei will sell? The individual products from these companies do not sell as many as individual iPhones. If they each sell ten million folding phones over a year I would be surprised. These are hero products, for bragging rights and to promote the idea they are innovators. It’s a different approach from Apple. You hear nada from it until the product is ready (AirPower a glaring exception). Other tech companies tell you about it well before release, and then load it up half polished. Er, no, the X was Apple’s best selling phone the entire time it was out. They stated it. The stories that it wasn’t doing well were fake news. Can’t believe you’re still dropping these FUD pellets. You think Apple would use a foldable screen on all iPhone models top to bottom? They would need nowhere near 200M+ IMHO. This a a relatively niche use, one model at a high price point would do. I don't see Apple jumping on this bandwagon until it is popularized and settled upon the thing won't break after a year of use, and sure they can infer this by early 2020, but I doubt Apple is in any rush to push such a device. No doubt Apple has been testing such screens for some time. Doesn't mean they're going to make a folding device. Like any large electronics company Apple likely has countless ideas being worked on at any given time to see which ideas are feasible and which aren't. My prediction is Apple will make changes to the UI so your EXISTING device is even more usable with multiple Apps, rather than make a device with a crappy folded screen that feels like a limp noodle every time you tap the screen. So, Samsung has current capacity to build 2.4 million flexible screens. Well, they’ll need to keep 10 of those for the Folds that they’ll sell. So, seems that need a buyer for those other 2,399,990 screens they can produce. I hope it’s a hard pass on Apple’s part. Absolutely no interest in plastic screen, scratches in two seconds and looks awful. I admire Samsung for being leaders in component technology. Does Huawei make foldable display on its own Mate X? Thanks, Samsung and Huawei never planned to sell tens of millions of foldable phones. Apple has nothing to do with foldable phones. How long was it out? Was the most popular in the last quarter it was out? I believe Apple made no mention at all of popularity in that last quarter. That omission coincided with reports of sales of iPhone X dropping off far faster than any other previous new iPhone. But as you are fully aware, Apple doesn't break sales down so 'most popular' could be as little as one more unit sold for each claim. All good for the message though, right? And when they said they would drop unit sale reporting altogether, we all nodded along with Lucas' reasoning, right? But forget all that and look at what and why I wrote that. Do you also think that Apple would need over 200 million Samsung folding screens? Return to sender—unopened. Not out of the realm of possibility for Samsung to claim patent infringement when Apple comes out with their own foldable phone. Although I don’t see a compelling reason why they would. Dumbest “consumer” product idea since Google Glass.